The wait is over. After years of development, the private spaceflight company SpaceX will unveil the manned version of its Dragon spacecraft tonight (May 28). SpaceX CEO Elon Musk will reveal the design for the manned Dragon spacecraft tonight at 10 p.m. EDT/7 p.m. PDT (2 a.m. May 30 GMT) in a special invite-only event at the company’s rocket factory in Hawthorne, California. SpaceX has built the commercial crew capsule in a bid to fly astronauts on trips to and from the International Space Station for NASA. 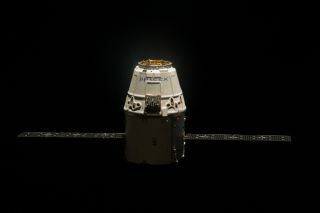 The Dragon V2, or Version 2 as the crewed Dragon capsule is called, is a gumdrop-shaped spacecraft designed to carry up to seven astronauts on trips to and from low-Earth orbit. Its maximum crew capacity matches that of NASA’s space shuttles, and is more than twice the capacity of Russia’s three-person Soyuz space capsules. Since the retirement of NASA’s shuttle program in 2011, the Russian Soyuz has been the only vehicle available for space station trips. Like the unmanned Dragon, the Dragon V2 will launch atop SpaceX’s Falcon 9 rocket, and is powered by solar panels. It carries parachutes for a water landing. However, the crew capsules will be outfitted with launch abort engines, called SuperDraco thrusters, to serve as an escape system during a launch emergency. The Dragon V2 is expected to include a forward-mounted docking system to attach to the International Space Station. Cargo space will be available at the rear of the spacecraft, in an unpressurized section that can hold up to 490 cubic feet (14 cubic meters) of cargo. NASA has providing some funding to SpaceX to develop the manned Dragon through the space agency's Commercial Crew Program, which aims to have at least one American astronaut taxi ready to go by 2017. Other funded companies competing to fly NASA astronauts include Sierra Nevada's Dream Chaser spacecraft, which is a shuttle-like vehicle that would use a runway to return to Earth, and The Boeing Co.'s CST-100 spacecraft that would launch on an Atlas 5 rocket.